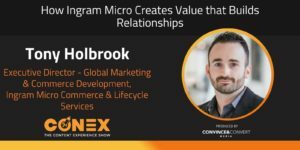 Tony Holbrook, Executive Director – Global Marketing & Commerce Development at Ingram Micro Commerce & Lifecycle Services, joins the Content Experience Show to discuss effective methods of outreach and strategies for converting prospective customers. It takes a massive amount of confidence and determination to step out and start a business, and if you have the product to back it up, it’s an inspiring story to tell. Unfortunately, there’s also the archetypal executive who absolutely hates the dreaded cold call. The question then becomes, if both of these are true, how can you reconcile the two sides? 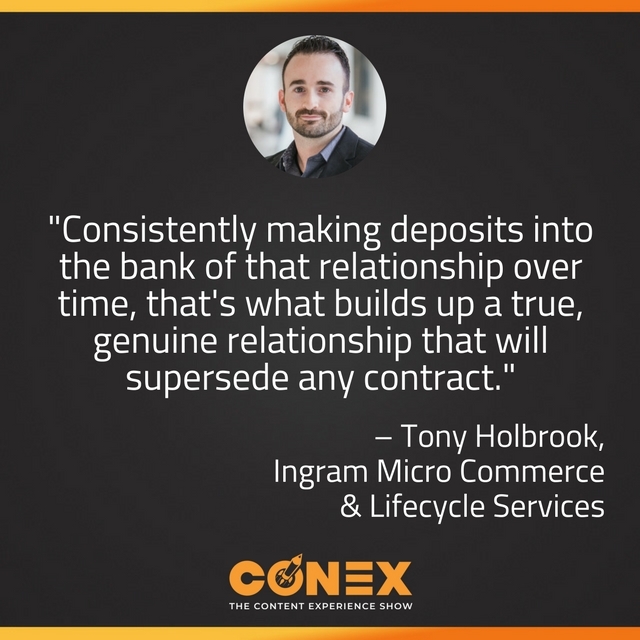 Tony Holbrook, of Ingram Micro Commerce & Lifecycle Services, believes that it all comes down to adding value. Rather than constantly seeking to force your product into someone’s field of view, try setting your product to the side and simply looking at how you can give something useful to your prospective customer. Not only will you start the relationship in a gracious way, but you are immediately demonstrating how you and your business can benefit them without the awkward (and often unproductive) sales pitch! We know that you are a life hacker, and that you have been called ruthlessly efficient by several people you’ve managed. What is one of your best, proudest, shining moments of life hacking? At a previous job, Tony applied Tim Ferris’ 4 Hour Work Week idea to an employee who managed the email operations. The employee was able to take two weeks worth of work and turn it into two hours in just three months! We have in our notes that you like hockey. So how are you filling that gap in your life, being in the Bay Area? Are you a Sharks fan? No way, Tony is a die-hard Canucks fan! So much so that his number two team is the Ducks because two of the Canucks went to them, but as soon as those guys are out he says they’re just as hated as any rival! Anna Hrach: Hey, everybody. Welcome to the Content Experience Show podcast. We are so happy to have you here with us. I am here with the always amazing Randy Frisch from Uberflip. Randy, I have to hand it to you on this episode because you did something that I love when marketers do, and that most marketers actually don't do, which is kind of reveal some of the bumps and bruises that they take on sort of their content path. My hat's off to you, for sure, on this one. Randy Frisch: Thanks, Anna. And you know what? It was a bit of a risk, I will admit. But I think it was an interesting opportunity as well. So, to give everyone some context, what Anna and I are talking about, I invited onto this podcast someone who was a prospect for us along the process at Uberflip, where they had a bad experience. They were outreached to at the wrong time by sales teams, and it just ... They had a bad vibe from it and they were getting really annoyed. But the thing that happened that doesn't always happen is Tony Holbrook actually reached out to me on LinkedIn and let me know. And we started to have this great dialogue about what we could do better and how we could approach it better, and I said, "You know what? Why don't we just talk about this on a podcast," because it was such an interesting opportunity to learn from what that customer experience is. And honestly, I felt like I learned a lot even beyond that instance, just from how Tony approaches content. Anna Hrach: Oh, totally. No, he gives some really, really great advice about just timing and relevancy and giving value rather than selling, which is funny because we've been talking about this a lot, and I just don't think it can be reinforced enough, though. I still think, from my perspective and Randy, let me know how you feel based on what you're seeing, it still feels like we're trying to, just as a collective community, sell too much rather than provide that value. Randy Frisch: Oh, I couldn't agree more. I mean, the light at the end of the tunnel here, though, is that that's what content's for, right? I think we just have to start to ... and we talked a lot about this in the podcast this week, but we have to start to move our mindset away from this idea that content marketing is something that's purely for inbound, versus understanding that content can be used at every stage of that buyer journey. That's something that Tony talks about a lot. For context for everyone tuning in, Tony is the VP of Marketing and Commerce for Ingram Micro Commerce, which is one of the products that Ingram Micro had brought together with this offering to solve, and he oversees all aspects of their marketing globally for the business unit, including demand chain, creative services, sales and marketing. And he really brings this refreshing look to how we can use content as a way to create engagement. Anna Hrach: Yeah, it's fantastic. I mean, he really has some great advice, some great tips and tricks. So what do you say we bring him in so he can talk about all of it? Randy Frisch: That's [inaudible 00:02:57]. This is a fun one. Get ready for this. Bumps and bruises, everyone. Anna Hrach: Tony, thank you so much for being here with us today. We're really, really excited to have you. Tony Holbrook: Thank you, thank you. Anna Hrach: So, just to kick us off, would you mind telling us a little bit about yourself? Tony Holbrook: Yeah, so currently, I guess for the last four years, I've been working for a company called Ingram Micro. A division of that started as a company called Shipwire, kind of focused on the third-party logistics space. Their tenet was enterprise logistics for everyone, so sort of democratizing enterprise class logistics and sort of that next day fulfillment, that sort of stuff, and trying to bring it to the everyman to be able to offer that. And so I was actually a client of them when I was working with another company, and relationships being what they are, over a few years, got back in touch with the company and ended up getting recruited by them. And that was just after Shipwire got acquired by Ingram Micro. And fast forward a little bit and Ingram Micro's made some changes, and now we've combined a bunch of entities, Shipwire and a bunch of the other companies, into a division called Ingram Micro Commerce and Lifecycle Services, and so I'm in charge of the marketing and commerce software development portions of that for the global entities. Randy Frisch: That's a wild ride. I've known some other people at Shipwire. We should figure out if we know some people from back in the day at another time. But there's actually an interesting story here for everyone tuning in as to how Tony and I got connected. Now, Tony, I'm gonna share this with people and we're just gonna go no BS type of day, really dig into what happened, the story here, which is that my team at Uberflip was very excited about potential to potentially work with Ingram Micro Commerce, and started outreach to Tony and his team. And I'm gonna be honest. We went too far. And too many attempts to cold call, email, hit you up in every way possible. And I think we went over the limit, and to the point where ... I admire Tony. He actually reached out to me - I think it was on LinkedIn, if I recall - and said, "Listen, Randy, this is too much and I just think you'd wanna know as CMO of a company when your team is kind of crossing that line of engagement that starts to be annoying on the prospect side." And I'm the type of guy, I love feedback, I love open communication. Tony and I hit it off. We had a whole bunch of back and forth, and as I was reading this thread, I was like, "This could be an amazing podcast." So without further ado, Tony, my apologies first, on the record, to everyone out there. And maybe we could talk a little bit about what in this day and age is an ineffective channel, and then we hopefully get to what are some good channels to engage with with prospects. Tony Holbrook: Yeah, that's a good question. This was part of the thing, is the ineffective channel, I think, these days, has kinda become cold calling. It's a very personal opinion. I mean, this is just me, but a lot of companies have a lot of good success with this stuff, and I'm not gonna knock it. I think for the right people with the right talent and the right sort of internal systems, the right tools and the right training and business processes, I think it can work. But too often, you're just hit with this just completely irrelevant outreach by somebody who has no context for what your business is, at a time that is completely inappropriate, and they ... More and more of these guys are trying to go upmarket in terms of the cold calling component of things, and they're trying to hit bigger fish and bigger executives and those type of things. And what they're trying to do is take an old model that worked on perhaps analysts and consultants and some of the more sort of frontline teams that maybe would be responsive to a 15-minute quick chat, but when you're reaching out to people that are directors and executives and VP's, they don't want to have a quick chat with you. They don't have time to have a quick chat with their wives or their husbands, let alone some person that I have no idea for, right? And so this has kind of been something that I've been ... been the bane of my existence a little bit for the last two years, because I've seen it done well for the right markets, but then when you see a little bit of success, they try to apply it to everything. And it just doesn't always work, and I think that's kind of what I saw here. And that's why, Randy, I just reached out to you and I said, "Look, you know, they're doing this. It's not gonna work. It's not effective, and here's another gap." So that's where I kind of wanted to ... I wanna make this better, right? I don't like hearing from other people at the shows, you know, like, "These guys are just harassing us." And a lot of the outreach teams that are doing this, they're good people, they mean well. They're just doing their job. They're trying to hustle and do their thing. It's just kind of maybe misguided in some cases, or they don't have the right tool set. And that's where I think we just need to do some adjustments. Randy Frisch: Yeah, I couldn't agree more, and first of all, so everyone knows, no one got fired over this. We use this as a coaching opportunity here and talk through it in terms of what is an effective way to engage the person on the other side. And it's funny that you bring up this mindset of how do we connect in a more authentic, genuine way, at the right time and the right way. And if you go back last year at one point, I was sitting in on our sales team. They were doing some training on a Monday morning kickoff, and they were mocking up a cold call situation. It was more of a discovery, though, so once someone's engaged. And I'm watching ... They were actually talking about ABM, and the BDR was learning how they would ask the right questions to get the person to give. And it was a great role play. Great questions, great answers, and I went home and I was like, "That was really well done." But the next morning, I remember someone phoned me - cold called me - and they asked me something tied to ABM, and I thought to myself, "There is no way I'm talking to this person right now." You know? And it made me look back to that outreach and say, "Okay, it's not genuine. We need to lead," as I said to our team, "We're not gonna get this feedback unless we give something first." Right? We have to give something if we wanna get something. And I think ... I dunno your thoughts, Tony, but what are some of the things that people will give to you that result in you saying, "Okay, I do want to engage here?" Tony Holbrook: Yeah, you're bang on, Randy, it's ... When somebody says ... You know, it's almost like you're making deposits in the bank kind of thing, right? So for you, it's starting as a net new, right? Let's say you and me, Randy, right? Say you're trying to reach out to me. Our relationship at this point is basically there's zero money in the bank, right? You have to make a deposit before you can make a withdrawal, right? And too often these people, they just wanna go straight to the withdrawal, right? They say, "Can I have 15 minutes of your time?" No, you can't, I'm sorry. Do you know how much that's actually worth to me? Not even in egotistical financial terms, but I don't have 15 minutes of time to give to you for you to satisfy your random inquiry or whatever it is. Tony Holbrook: There's a company called SiriusDecisions. They're kind of like the Gartner or the Forrester of sort of B2B marketing analysts. So these are all like ... Randy, this would potentially be sort of the next step of your career kind of thing, right? Like you'd go there and you'd advise these people. And they have an analyst firm. And so my first initial interaction with that company, the first touchpoint, the first deposit they made in the bank, was one of their guys, they did some research on it, and it wasn't like an SDR. This was like an account executive, somebody that ran a territory kind of thing. And he did some research into our company, realized that I was in charge of two facets at that point - it was product marketing and demand generation - and he pulled together sort of a curated set of industry data. They produce 20-page reports. He pulled out a one-page sample of this and a one-page sample of that, curated this stuff together, and sent me a very thoughtful email and said, "Hey, I don't think you know who we are. I don't think you've ever reached out to us, at least I don't see it. I notice that you're doing this. I notice you're doing this. We just pulled this information. I thought it would be helpful. Of course, I'd love to have a conversation, but I just thought it would be helpful and we'll start with that." And there was no ask. There was no next step. It was just a deposit in the bank. And that really, really resonated with me. And the content was so good. Their product was so good that I read it and I'm like, "Yeah, I want more." Now, I understand that if I give you 15 minutes, what value I'm going to get back out of it. Anna Hrach: That's actually really fascinating, and also a very amazing approach. And I think as you were sort of relaying that story, one of the things that kind of came to mind is you touched on the concept of how valuable time is, and you mentioned, "You know, I don't have 15 minutes to give to you," but as soon as somebody presented something incredibly relevant to you, you made time for that. So I think that's interesting, where a lot of times we say that we don't have time, but in reality, it's, "I don't want to make time for you because what you're presenting to me doesn't matter." But as soon as they presented some content to you that was relevant and was worth your time, you were willing to carve out that 15 minutes. Now, Tony, I know that content can be used sort of in terms ... as a replacement for some of those cold calling, as you had mentioned. How do we not make some of those same cold calling mistakes that we then can sort of push into content? How do we not bring some of those bad habits and some of those bad best practices over into our content? Tony Holbrook: Yeah, you know, the ... My background is in sort of like IT and data and stuff like that, so I always go back to the accuracy of the data, right? It's kind of garbage in, garbage out. And I think this is amplified in the cold calling world. And actually the initial reason that Randy and I ended up talking was because it wasn't the fact that the guy was reaching out to me, or even that. I'd had a bunch of conversations with Uberflip, and it just was never the right timing. But it was always a genuine conversation. The thing that sort of pulled the trigger on this was the guy called me at 6:30 AM, and that, to me, showed just a ... Either he didn't check what it was, or the data he was being served up and being triggered to make that phone call, was not doing him ... It was not setting him up for success, right? So now if you'll apply that in the content world, I still get outreaches. Ingram Micro is a big, giant company. I get outreaches all the time for people trying to sell me product or asking me to buy their product. And if they just looked at my LinkedIn page, they would realize that I'm not part of that division. There's nothing in my experience or my history that says that I am a technology distribution guy. I'm all e-commerce, all fulfillment. That's all I have ever been, right? So I think if you apply to the content world and the sharing of that sort of stuff, you have to have this underlying accuracy of data so that the team can actually be successful, right? Tell them what industry I'm in, tell them ... Try to educate them on the pain points of what I'm feeling. Tee those type of data sources up and not superficial ones, not follower count on Instagram or anything like that. It has to be genuine. And I think, Randy, you mentioned that earlier. It has to be genuine. And for anybody who's doing cold calling and outreach, whether it's through a digital medium like email or over phone, you need to understand who you're reaching out to. And the only way that you can get to that is either by building on that relationship over time or being provided with a good set of data at the beginning for you to kind of form at least enough of a picture, and then just apply your kinda sales talent to filling in the blanks and being sensitive about what you're assuming, and maybe asking probing questions when the time comes up. Anna Hrach: Nice. So it really is all about knowing your audience and really creating that experience that matters to them, and actually provide something, exactly like what you said, put something in the bank and makes a deposit of something of value. Before we get into sort of how you and your team have been able to implement some of these things, I'd love to take just a quick break and then come back and chat about all the efforts that you're in charge of and all the things that your team is doing in terms of content. How's that sound? Anna Hrach: Okay. We'll be right back. 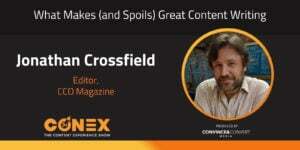 Randy Frisch: Welcome back to [ConEx 00:15:56]. We are here chatting with Tony Holbrook, and we spent the first half of this podcast really drilling into how much my team dropped the ball. So now, Tony, I get to flip it on you and say like, "Teach us the right way. Show us some of the great things that you and your team have done that I can learn from, I can take back to my teams, our listeners can take back to theirs." So maybe you can share with us some of the things that you're doing with content. Maybe not specifically to arm sales, but I'd love to hear that. But really to arm your organization. Tony Holbrook: Yeah, so there's the normal content development. We've been spending a lot of time this year thinking about benchmarking and industry data and industry trends. I kind of think about it myself. When I sit here and somebody's reaching out to me and saying, "You need the next marketing tool," or whatever it is, I can kinda go, okay, who else in my industry is using it, have I run into it before, and that type of stuff. And so we've been spending a lot of time trying to pull together benchmarking data and trying to provide something back of value to the customer. So in our space, there's a lot of decisions that are made by brands and retailers on how many fulfillment endpoints to use, right? Do they use one distribution center in Los Angeles or Chicago, or do they have a two-node network or a three-node network, or something like that? And it's always kind of this just random decision that kinda has to be made. And what we found is when we go back to both prospects and existing customers and we say, "Okay, you are a typical, say, consumer product goods brand, right? And you have this type of order volume and this type of product. Your industry and your benchmarks of people say on average, they only need two distribution centers and that covers 99% of the industry." Or 99% of the U.S. Or in this case it's a three distribution, or three-node network. Those type of things. Randy Frisch: So it sounds ... Just to jump in there for second. So, is it more, in your case, industry data, or is it more customer stories? 'Cause I think those are two things that people often get confused, between industry data and customer stories, as to what's the right piece at the right time. Tony Holbrook: ... It's, give me a story to go tell my CFO, and that's the user story. That's the case study. Randy Frisch: Yeah, what you called the hook there, I believe, I often call in our company, we have to sell the disruption. Right? We have to sell why you should change, why things are changing around you, and why if we don't open up our eyes, we're gonna be left behind. Tony Holbrook: Yeah, yeah, bang on. Anna Hrach: So Tony, we've been talking a lot about the difference between sort of adding value versus selling. For companies who are really looking to make the shift from really just focusing on selling to really adding value, what are some tips that you would impart on them? Tony Holbrook: One thing that's been really effective for us ... When you're trying to add value, it's almost in a passive way. I don't know really the right way to describe this, but I'll give you an example. So, we used to have a webinar program. When we were doing a lot of the e-commerce fulfillment for the everyman, for the SMB market and everything, we did the cold outreach stuff but we found we were getting the wrong people at the wrong times. And so instead, we flipped it on its head and we had a program that was set up where we had two or three of our kind of top product experts, they would run webinars two, three times a week. And it was just sort of passive outreach, right? It was a heavy cost for us as a business, right? We had to set up this studio in our office, we had to develop the content, we had to dedicate the resources and the software and everything to do this, but the engagement of that over time was amazing. And what we found is we would have one person from the company join this week, and then two people from the same company in the subsequent weeks. And so it was this kind of passive, just let me put the value out there, and I'll let you sign up for it when you're ready to go. Right? And so there was this live interaction component that was available on a scheduled point, but there was always the recorded versions that were still there for you just to listen in while you're on your drive to work or whatever it happens to be. But it was almost putting the value out there and letting them consume it when they felt it was right for them, and making it easy to do so. Anna Hrach: Nice. I love the different formats and just making it easy for people to consume content on their own time. As a follow-up question to that, so in addition to sort of making that shift from selling to adding value, sometimes that can also make some of the metrics or some of the ROI that companies typically use to measure content a little bit wonky. How do you kind of help people understand that adding value doesn't necessarily mean a one-to-one sale, but it helps build out that pipeline and sort of ensures a consistent flow, versus people who may be looking very much at, okay, if we do this piece of content, what are we gonna get from it immediately, right? So it kind of builds out that pipeline and extends thing a little bit. How do you sort of reassure people that this is the right approach? Tony Holbrook: Yeah, you've gotta stop looking at lead source. It's such a misleading metric that that first touchpoint is the all savior, it's the thing that works the most. I mean, we are so sort of oblivious to what the actual true first touchpoint is. Somebody comes to your website and fills out a form ... That form didn't close that business. You gotta ask yourself what made that person decide to go type that thing into Google or the URL into the browser to actually go do that. And so we used to spend a lot of time talking about lead source, lead source, lead source. Over the last kinda 12 to 24 months, I'm focusing on touchpoints. And I really don't care whether they filled out a form to begin with, or we met them at event, I wanna know a cadence, right? It's a consistency, it's a relationship. If you go weeks without talking to your mom, she's gonna let you hear it and there's not that sort of ... She's not gonna think that you're getting that value out of that sort of conversation, right? But if you have this consistent drumbeat, this consistent trickle of, "Here's this piece of content," or "Here, we ran into you at this event," or, "Here's a dinner that I can invite you to," or "Here's a partner I can connect you with," you're consistently making those deposits into the bank of that relationship. And over time, that's the thing that really builds up, and builds a true, genuine relationship that will supersede any contract. Randy Frisch: It's so bang on, and assuming people are still listening and they haven't dropped off to call their mother, I think everyone agrees with that. It's something that, Anna, you and I talk about so often on this podcast, it's the importance of the buyer journey, right? And mapping out that buyer journey and thinking about content not as this silo that we just create content to keep fueling an inbound, but we create content to map the different steps and points of engagement, and I think that's the exciting level of maturity that we're at with content marketing, where same thing where product marketing was for a long time. 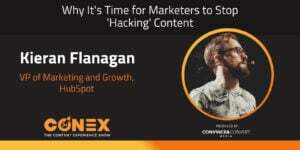 It used to be about educating about your product through a drip email campaign, but now it's about what are those case studies, as you said, Tony, that we're gonna use at a certain stage, versus maybe the industry analytics, to hook you in at the beginning. So this has been really intriguing. It's been an awesome conversation. I give you full credit for reaching out to me, Tony, and I'm glad that we're at this point of our relationship and hopefully push each other to be better marketers in these ways. If you've got a couple more minutes, we're gonna get you to stick around. We'd love to get to know our guests a little bit beyond the podcast and their work resume, so we'll be right back here on ConEx. Anna Hrach: All right, Tony, so we've gotten to know a lot about you professionally. So let's flip over to the personal side. We have a couple of personal questions for you today. The first one is, we know that you are a life hacker, and that you have been called ruthlessly efficient by several people you've managed over the years, thanks to your ability to really optimize and increase efficiency. What is one of your best, proudest, shining moments of life hacking? Tony Holbrook: That's a good question. I feel like I should've done some research or some planning into that. You know, I spend a lot of time just really looking at optimization of flows and people's time and stuff, and so we ... At a previous life, I was doing B2C e-commerce for a big Canadian retailer, and we were ... Our email deployment process was just crazy, just absolutely crazy. And it took us two weeks just to get things wired up and do those sorts of things, and so basically what I did is I actually applied the 4-Hour Workweek, Tim Ferris model to the guy that was running our email operations. And I said, "Look, if you had to completely outsource this, and you only had four hours a week to actually work, how would you actually go about this?" And it really challenged his mindset. He was thinking he could get this thing down from two weeks to a week and a half or something, and I challenged him to get it done in a day. I wanted him to have everything done. If something was on your desk, a brief was on your desk at 8:00 AM and you had all the assets and the tools and everything that you needed, could you get that thing wired and out the door and to the point where we had this thing where every time an email went out, it was actually a very clear dollar figure attached to that. I said, "So if you can do this in a single day, how would you approach it?" And so what he did is he found a combination of using some vendor tools and some software automation and some stuff to do sort of rendering testing and stuff like that, and was able to actually get this thing down. So it actually took him less than two hours now. He could do this stuff and he went from two weeks to two hours in about the span of about three months. And it was literally applying kind of these life hacking techniques about almost being lazy to every workflow and every process. And what I think he realized was he was over-analyzing a lot of these things. He was spending a lot of time on these things. He wasn't leveraging these tools. He assumed he had to carry all of the weight on his own shoulders, when really he could just make many hands do the light work sort of thing, right? And so I guess that's where I try to apply something that I had personally believed in, and I'm a big Tim Ferriss fan. I've been listening to that stuff for a long time, and just tried to apply it from the personal world into the professional side of things. And the results were there, so it was good. Anna Hrach: Nice. I love your whole comment about the lazy way. I'm pretty sure it's a real Bill Gates quote. It's at least attributed to him a lot, about how he says, "I choose a lazy person to do a hard job because the lazy person will find an easy way to do it." I feel like that's kinda the life hacking model. Randy Frisch: Tony, I know one more ... I think before we wrap up, I'm curious, 'cause you dropped your Canadian roots there, working for Mountain Equipment Co-op, which is one of the coolest stores to go into, for American listeners. And people know that I'm a big, proud Canadian. I talk about it a lot on this podcast. You dropped, in kind of the get to know you notes that we got, that you like hockey. So how are you filling that gap in your life, being in the Bay Area? Are you a Sharks fan? Tony Holbrook: No, not even a chance. No, no, I watched the Sedins do their last game last night from a big Canucks fan, always have been. Doesn't matter where I live in the world. It will still be there. I mean, I just ... I appreciate the game first, I think, and then the team second. I've tried to ... You know, we had a lot of Canucks that ended up going for the Anaheim Ducks and so the Ducks are maybe number two up there, but you know, as soon as Kesler and Bieksa and those guys are gone from that team, I mean, the Ducks are just as hated [inaudible 00:29:15] enemy as the Sharks would be, so that's how I do it. Randy Frisch: Nice. I love it. I love the loyalty, or the following of the individuals. Tony, this was a ton of fun. I think we learned a ton on this podcast. We thank you for taking the time. I'm glad we were able to connect after all the fun beginnings that we had. 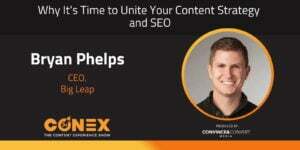 For everyone who's enjoyed listening to this podcast, I hope you'll tune in to the other episodes of the Content Experience Show. You can check them out at convinceandconvert.com. You can find us on iTunes, on Stitcher, on Spotify, on Google Play, anywhere you can get your podcast, and especially when you can leave feedback, let Anna and I know what you'd like to hear better. Until next time, I'm Randy Frisch from Uberflip, Anna Hrach from Convince and Convert, and thank you to Tony Holbrook from Ingram Micro Commerce.